Each and every day, Tufts students have the privilege of waking up to a beautiful campus. After strolling across the quad to class, we sit through lecture in academic buildings, grab lunch in the dining hall, hang out in the Campus Center and at the end of the day, return to the dorm we have learned to call home. With all the hustle and bustle of life at Tufts, it becomes easy to forget the people who make all of these spaces neat, clean and conducive for us to learn. Tufts janitors are valued members of our community, but they often go unnoticed and unseen. Without their hard work day in and day out, Tufts would not be the institution it is. We owe a great deal to these devoted individuals. Unfortunately, Tufts administration is failing to treat janitors with the respect they deserve. According to union representatives, the administration seeks to cut costs by firing janitors through its contractor, DTZ. 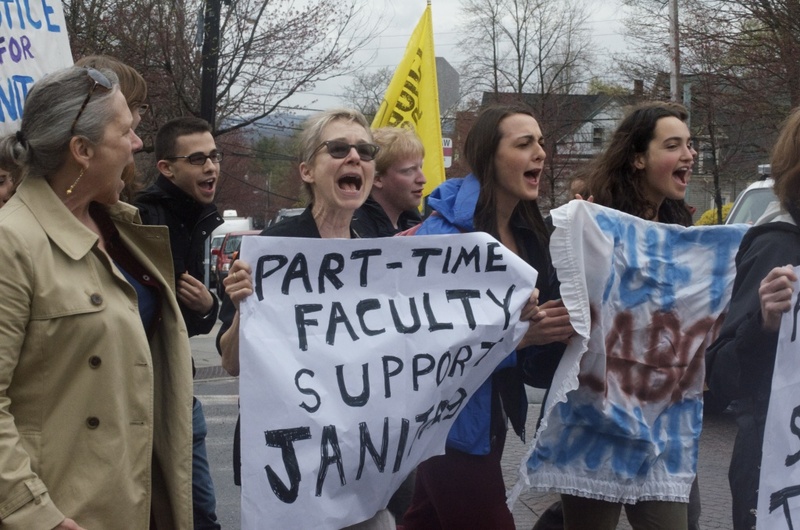 Tufts will not announce these cuts publicly or all at once — they plan to cut janitors quietly and slowly without drawing significant attention. As students, we cannot let these cuts go unnoticed. By keeping these details hidden, the administration is not giving janitors the respectful treatment they deserve. These often-unseen members of our community contribute to making Tufts the university we all know and love. Already, few janitors receive full-time benefits and all of them are overworked and paid low wages for long hours. The proposed personnel cuts will only exacerbate these problems. The remaining janitors will have to take on a larger load, and there will not be nearly enough staff to properly clean the campus and dorms. The cuts would result in each janitor having to clean one or more entire building by themselves per day. Most importantly, these cuts would devastate the lives of laid off janitors and their families. After leaving the Tufts campus, these individuals do not just disappear — they go home to husbands, wives, sons and daughters whom they work so hard to support. If these individuals are laid off, we as students have the privilege to go on about our daily lives, our greatest worry being a midterm next week. But we cannot maintain dignity as members of the Tufts community while allowing the livelihoods of these workers to be snatched away from them. We, the Tufts community, must stand against the administration. We must stand up for our valued janitors. We must demand that Tufts executives find other ways to cut costs than decimating the livelihoods of hardworking members of our community. If you want to take a stand with us, come learn more and meet the janitors at Tufts Labor Coalition’s Support Our Janitors Luncheon, on Friday, Oct. 17 from 1-3 p.m. in Distler Lobby in Granoff Music Center.